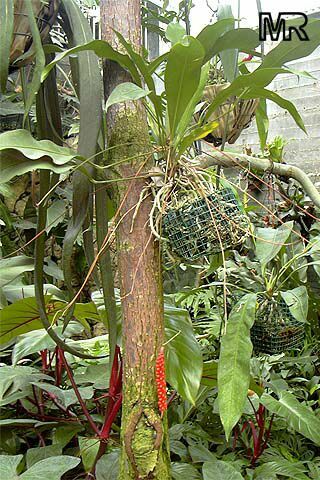 An attractive species with slender leaves and a graceful semi-pendant spike of vivid red berries. Slender, deep green leather leaves form a loose upright rosette about 18in tall. An interesting species that in nature has a close relationship with ants. According to Benzing, the seeds resemble the pupae of ants, and are collected by arboreal ant species and placed in the nest where they germinate. Self pollinating, and fruits regularly. 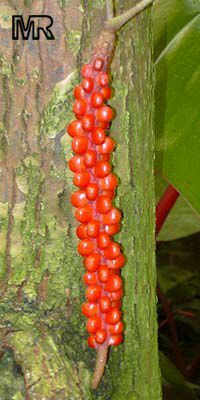 Beautiful strings of red seeds hang from the plant most of the year. Grows in shade.